For an adequate formation of a culture, the involvement of the whole man is required, whereby he exercises his creativity, intelligence, and knowledge of the world and of people. 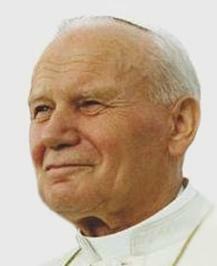 John Paul II (18 May 1920 – 2 April 2005) served as pope of the Catholic Church and sovereign of the Vatican City from 1978 until his death in April 2005. Born Karol Wojtyła in the Polish town of Wadowice, he served as archbishop of Kraków before becoming the first non-Italian pope in 455 years and the first pope of Slavic origin. He was one of the longest-serving popes and one of the most-travelled world leaders in history. Continuing the reforms of the Second Vatican Council and professing the philosophy of Christian humanism, John Paul II taught about the importance of family and respect for human life and dignity. He criticised materialist ideologies and is widely seen as having been instrumental in ending communism in his native Poland and eventually in all of Eastern Europe. The pope also mended the Catholic Church's relations with other denominations and religions, and, as part of his special emphasis on the universal call to holiness, he beatified and canonised a record number of people. How could man have such utter contempt for man? Because he had reached the point of contempt for God. When asked whether it was becoming for a cardinal to ski (Cardinal Wojtyła was an avid skier). Carissimi fratelli e sorelle, siamo ancora tutti addolorati dopo la morte del nostro amatissimo Papa Giovanni Paolo I. Ed ecco che gli Eminentissimi Cardinali hanno chiamato un nuovo vescovo di Roma. Lo hanno chiamato da un paese lontano... lontano, ma sempre così vicino per la comunione nella fede e nella tradizione cristiana. (...) Non so se posso bene spiegarmi nella vostra... nostra lingua italiana. Se mi sbaglio mi correggerete. Dear brothers and sisters, we are all still grieved after the death of our most beloved John Paul I. And now the eminent cardinals have called a new bishop of Rome. They have called him from a far country... far, but always near through the communion of faith and in the Christian tradition. (...) I don't know if I can make myself clear in your... in our Italian language. If I make a mistake, you will correct me. Note: the pope intentionally mispronounced the Italian word correggerete, "you will correct". I wołam, ja, syn polskiej ziemi, a zarazem ja: Jan Paweł II papież, wołam z całej głębi tego tysiąclecia, wołam w przeddzień święta Zesłania, wołam wraz z wami wszystkimi: Niech zstąpi Duch Twój! Niech zstąpi Duch Twój! I odnowi oblicze ziemi. Tej ziemi! And I cry – I who am a son of the land of Poland and who am also Pope John Paul II – I cry from all the depths of this Millennium, I cry on the vigil of Pentecost: Let your Spirit descend! Let your Spirit descend! And renew the face of the earth. The face of this land! Note: the Polish word ziemi means both "earth" and "land"; on the former utterance, it refers to the entire planet, on the latter – to Poland. This inscription awakens the memory of people whose sons and daughters were destined for total extermination. This people draws its origin from Abraham, our Father in faith. The very people that received from God the commandment, thou shalt not kill, itself experienced in a special measure what is meant by killing. It is not permissible for anyone to pass by this inscription with indifference. The Church is called upon to manifest anew to everyone, with clear and stronger conviction, her will to promote human life by every means and to defend it against all attacks, in whatever condition or state of development it is found. Thus the Church condemns as a grave offense against human dignity and justice all those activities of governments or other public authorities which attempt to limit in any way the freedom of couples in deciding about children. Consequently, any violence applied by such authorities in favor of contraception or, still worse, of sterilization and procured abortion, must be altogether condemned and forcefully rejected. Likewise to be denounced as gravely unjust are cases where, in international relations, economic help given for the advancement of peoples is made conditional on programs of contraception, sterilization and procured abortion. Christian marriage and the Christian family build up the Church: for in the family the human person is not only brought into being and progressively introduced by means of education into the human community, but by means of the rebirth of baptism and education in the faith the child is also introduced into God's family, which is the Church. The human family, disunited by sin, is reconstituted in its unity by the redemptive power of the death and Resurrection of Christ. Christian marriage, by participating in the salvific efficacy of this event, constitutes the natural setting in which the human person is introduced into the great family of the Church. The commandment to grow and multiply, given to man and woman in the beginning, in this way reaches its whole truth and full realization. In virginity or celibacy, the human being is awaiting, also in a bodily way, the eschatological marriage of Christ with the Church, giving himself or herself completely to the Church in the hope that Christ may give Himself to the Church in the full truth of eternal life. The celibate person thus anticipates in his or her flesh the new world of the future resurrection. By virtue of this witness, virginity or celibacy keeps alive in the Church a consciousness of the mystery of marriage and defends it from any reduction and impoverishment. Virginity or celibacy, by liberating the human heart in a unique way, "so as to make it burn with greater love for God and all humanity," bears witness that the Kingdom of God and His justice is that pearl of great price which is preferred to every other value no matter how great, and hence must be sought as the only definitive value. It is for this reason that the Church, throughout her history, has always defended the superiority of this charism to that of marriage, by reason of the wholly singular link which it has with the Kingdom of God. Right from the beginning of my ministry in St. Peter’s See in Rome, I consider this message [of divine mercy] my special task. Providence has assigned it to me in the present situation of man, the Church and the world. It could be said that precisely this situation assigned that message to me as my task before God. homily of J-P II at Radom military base in Warsaw, Poland on June 4, 1991. Drodzy bracia i siostry Kaszubi! Strzeżcie tych wartości i tego dziedzictwa, które stanowią o Waszej tożsamości. Science develops best when its concepts and conclusions are integrated into the broader human culture and its concerns for ultimate meaning and value. Scientists cannot, therefore, hold themselves entirely aloof from the sorts of issues dealt with by philosophers and theologians. By devoting to these issues something of the energy and care they give to their research in science, they can help others realize more fully the human potentialities of their discoveries. They can also come to appreciate for themselves that these discoveries cannot be a genuine substitute for knowledge of the truly ultimate. Science can purify religion from error and superstition; religion can purify science from idolatry and false absolutes. Each can draw the other into a wider world, a world in which both can flourish. Source: Russell, Robert J.; Stoeger, William R.; Pope John Paul II; Coyne, George V. (1990). John Paul II on science and religion: reflections on the new view from Rome. Vatican Observatory Publications. every individual is made in the image of God, insofar as he or she is a rational and free creature capable of knowing God and loving him. many women, especially as a result of social and cultural conditioning, do not become fully aware of their dignity. Others are victims of a materialistic and hedonistic outlook which views them as mere objects of pleasure, and does not hesitate to organize the exploitation of women, even of young girls, into a despicable trade. Special concern needs to be shown for these women, particularly by other women who, thanks to their own upbringing and sensitivity, are able to help them discover their own inner worth and resources. Women need to help women, and to find support in the valuable and effective contributions which associations, movements and groups, many of them of a religious character, have proved capable of making in this regard. Man is called to a fullness of life which far exceeds the dimensions of his earthly existence, because it consists in sharing the very life of God. The loftiness of this supernatural vocation reveals the greatness and the inestimable value of human life even in its temporal phase. (...) New knowledge has led to the recognition of the theory of evolution as more than a hypothesis. It is indeed remarkable that this theory has been progressively accepted by researchers, following a series of discoveries in various fields of knowledge. The convergence, neither sought nor fabricated, of the results of work that was conducted independently is in itself a significant argument in favor of this theory. to argue according to rigorous rational criteria is to guarantee that the results attained are universally valid. peace is possible. It needs to be implored from God as his gift, but it also needs to be built day by day with his help, through works of justice and love. God of our fathers, you chose Abraham and his descendants to bring your Name to the Nations: we are deeply saddened by the behaviour of those who in the course of history have caused these children of yours to suffer, and asking your forgiveness we wish to commit ourselves to genuine brotherhood with the people of the Covenant. A society will be judged on the basis of how it treats its weakest members; and among the most vulnerable are surely the unborn and the dying. Any procedure which tends to commercialize human organs or to consider them as items of exchange or trade must be considered morally unacceptable, because to use the body as an "object" is to violate the dignity of the human person. Acknowledgement of the unique dignity of the human person has a further underlying consequence: vital organs which occur singly in the body can be removed only after death, that is from the body of someone who is certainly dead. This requirement is self-evident, since to act otherwise would mean intentionally to cause the death of the donor in disposing of his organ. It is helpful to recall that the death of the person is a single event, consisting in the total disintegration of that unitary and integrated whole that is the personal self. The death of the person, understood in this primary sense, is an event which no scientific technique or empirical method can identify directly. Human experience shows that once death occurs certain biological signs inevitably follow, which medicine has learnt to recognize with increasing precision. In this sense, the "criteria" for ascertaining death used by medicine today should not be understood as the technical-scientific determination of the exact moment of a person's death, but as a scientifically secure means of identifying the biological signs that a person has indeed died. The twentieth century was the great century of Christian martyrs, and this is true both in the Catholic Church and in other Churches and ecclesial communities. Source: Pope John Paul II (2005). Memory and identity: conversations at the dawn of a millennium. Rizzoli. Could I forget that the event [Mehmet Ali Ağca’s assassination attempt] in Saint Peter's Square took place on the day and at the hour when the first appearance of the Mother of Christ to the poor little peasants has been remembered for over sixty years at Fatima in Portugal? For, in everything that happened to me on that very day, I felt that extraordinary motherly protection and care, which turned out to be stronger than the deadly bullet. I have looked for you. Now you have come to me. And I thank you. God assigns as a duty to every man the dignity of every woman. When you wonder about the mystery of yourself, look to Christ who gives you the meaning of life. When you wonder what it means to be a mature person, look to Christ who is the fullness of humanity. And when you wonder about your role in the future of the world and of the United States, look to Christ. The moral life presents itself as the response due to the many gratuitous initiatives taken by God out of love for man. Young people of every continent, do not be afraid to be the saints of the new millennium! Be contemplative, love prayer; be coherent with your faith and generous in the service of your brothers and sisters, be active members of the Church and builders of peace. John Paul had sought rapprochement with Islam, which he appeared to view as a strategic ally in the struggle for "family values" and post-Englightenment thinking; during his pontificate, the Vatican had teamed up with Islamic governments at international human rights conferences to thwart European proposals for Third World birth control and other modernist evils. Bruce Bawer While Europe Slept: How Radical Islam Is Destroying the West from Within (1st ed. ed.). New York: Doubleday. p. p. 217 (of 288). ISBN 0-385-51472-7. .
Pope John Paul II was received in Israel with enthusiasm that sometimes bordered on the excitement generally reserved for pop stars. He radiated warmth. Pope Benedict XVI, in contrast, comes across as restrained, almost cold. Michael Moore Emily Schultz. Michael Moore: A Biography (1st ed. ed.). Chicago: Independent Publishers Group. p. p. 191. ISBN 1-55022-699-1. . The present Pope is a man I hold in high regard. To begin with, our somewhat similar backgrounds give us an immediate common ground. The first time we met, he struck me as a very practical sort of person, very broad-minded and open. I have no doubt he is a great spiritual leader. Any man who can call out "Brother" to his would-be assassin, as Pope John Paul did, must be a highly evolved spiritual practicioner. Dalai Lama Freedom in Exile: The Autobiography of the Dalai Lama (1st paperback ed. ed.). San Francisco: HarperCollins Publishers. p. p. 202 (of 288). ISBN 0-06-098701-4. .
John Lewis Gaddis The Cold War: A New History (1st ed. ed.). New York: Penguin Books. p. p. 193. ISBN 978-0143038276. .